Ten Ren's Whole-Leaf tea bag series offers tea bag enjoyment in a whole new way. Whole-Leaf tea bags are manufactured with a special new machine that allows the whole tea leaf, as found in our loose tea products, to be placed into a tea bag instead of having to cut the tea leaves into a smaller size. Some tea connoisseurs believe that whole tea leaves are one of the best ways to enjoy tea. 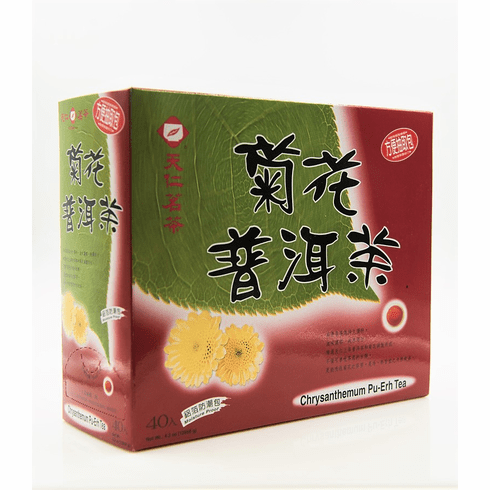 This Chrysanthemum Pu-Erh tea is composed of Pu-Erh tea leaves blended with fresh chrysanthemum flowers. Water at boiling point should be used for steeping. Available in boxes of 40 bags. Dimensional shipping weight is 1.35 lbs.